After all the great info that I have received from many of you in the "To UL or not to UL..." topic, I'm now getting to final choices. I have configured my list of kites to have them in front of me and sorted by price (not by preference). Because of price range and because of design (remember I'm currently flying a Nexus). I have been thinking about a good question that B-13 asked which is what I think my flying style is or will be. I think I like entering the tricks world but I will be one of those that likes to have each trick recognisable and not do forty tricks one after the other frantically. Also I think I will like some precision and smooth (but fastish) flying. On the other hand, as I said, in my area I have gusty winds, although in summer I've been told we have pretty steady breezes at the beach (I have still not been able to taste them since I only started flying in October). So what would you doctors say is my best medicine? You didn't tell us which one you thought looked the best to you. Not heard to much about the Toxic - R-sky build quality has been a bit so-so in the past. The Black Pearl is one of the latest must have kites, nice but expensive. My choice personally would be the Soul - I have one and it's a great kite, Build quality is excellent, smooth as a hot knife through butter, vary capable, decent precision, standard will go down to about 4mph up to about 15-18mph before it really starts to pull, easy to fly- it doesn't need any special inputs. A very under-rated kite and a good price too. I wish I could get another one but it's yet another kite we can't easily get in the UK. Have you looked at the HQ Infinity? 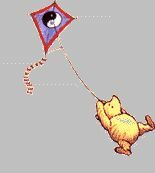 Another very good all round kite. I've flown the Black Pearl UL, Deepspace and Infinity STD. Id say the Infinty would be more friendly to a beginner. The Black Pearl is nice but it does require more work then the Infinity. I dont think the deepspace would suit you then. The Widow Maker is your best bet. For the winds you describe, it fits great. The WM flies like you describe, tricky when you want, precise if you want, and always forgiving. I bought mine because I always wanted to try one, not because I liked the way it looked. Turns out to be my most flown kite (out of over 50) to the point where I hardly fly anything else. I got over the looks issue, and actually find the pattern easier to follow than most when the kite is in different positions. Sky Burner Widow Maker... August 2011. Maybe, my choice of those three is absolutely a wrong match with my definition of style. I have not flown all of the kites on your list. And what I like may not be what you like. Another thing to consider is if you would ever go for a complete set: UL, std, vented. The Talon and Infinity can be had in all 3 configurations. Do you want custom colors? That would rule out the Infinity. The choices are the fun part. Don't get what I like. Get what you think you would like. Although I would suggest not getting the Hypnotist, Silver Fox or Zephyr. But then, I would add the Quantum Pro, although old by many people's standards, it is still an outstanding kite and available in multiple configurations. And as Allen Carter has often said, even if you don't like a kite, you can sell it on the Swap Meet and you have merely rented it. Come to Las Vegas for a Friday night fly. Between several of us, we have all those kites. I am also biased. I have more Ken McNeill kites than any other manufacturer (if you don't count stacks as separate kites). I'll think about the combinations Std, UL, Vented & color options. Indeed these are points to consider. BTW, I wished I could join you in Las Vegas. It would surely be awesome and I would learn so much. Although it is a bit far from Barcelona, if I ever go there I'll drop you a message. As far as I know at the moment there isn't an Infinity UL - at least not an official one. There are a couple of standards that have been modified the UL spec and I know HQ have been toying around with their own. I have heard a whisper of a rumour that there may be an Infinity UL next year which would make sense as it would complete a very nice set of kites. I left out the Infinity from the list of kites I've flown and liked. The Infinity is a lot of kite for the money. Sorry. I'll go correct the list. I've read really good reviews about it being precise and controllable, but still very good for tricks. So it kind of sounds good to me for the definition I provided of my flying style. And I really like its design. Would it be like, "strange" to have a Soul as a second kite after a Nexus? I mean, would I be "atypical"? Could it hinder my learning in anyway? My second option is starting to be the WidowMaker just because I see so many fliers recommend it. Although it is a bit more expensive (I would rather stay under the $250 limit as much as possible) and the design really does not appeal to me (neither outline shape nor sail pattern). Out of the three you mentioned, I'd say Soul, Soul, Soul. Highly underrated, very capable kite. Good build quality, great trickster, better than average in the UL and Vented models. I L-O-V-E my Widowmaker more than my Soul. But it is more expensive to buy. You will laugh out loud as you find out how much more trickable a high end kite is. This is the kite I fly the most and find the Infinity sail, while lacking color is the most interesting of any kite I own. Plus I would buy an UL if ever sold. Like the Soul it is a great value and worth consideration. I envy all of you in the US with such active kite clubs. Here I have nobody to chat with and no fellows that can let me try out other models and get a better idea of what they are like. I have the great opportunity to attend the Friday night fly in Las Vegas. It is wonderful to fly many of these high end kites. I'm ready to buy an UL but I still can not decide, as all are great kites. To me, you are chosing a flying partner to spend months or years together developing your skills and learning new tricks. So feel comfortable with any choice you make knowing you can not go wrong.